These non-toy kid gift ideas will bring more memories and less stress! When my oldest child came along, I was so excited to get gifts for her. There’s nothing like the excitement of the first Christmas, the first birthday, and the first chance to gift toys to your child. As time went on, she got more and more toys. We were both in heaven. Next, along came our son and then another daughter. And there were more toys. Building toys. Singing toys. Beeping toys. Remote control toys. Painful when stepped on toys. Oodles and oodles of toys. As I looked around, I saw a sea of toys that had taken over our home. Toys that were too hard for me to part with because they were gifted from someone we loved and toys that the kids had forgotten about until the moment they saw them in the donation pile. Children have a few toys that they absolutely love. They’ll cherish these toys for years on a regular basis. They stop working or break after a month. They need new batteries that cost more than the toy itself. Some of them just go missing, buried at the bottom of the toy box. The magic of opening presents fades away. And as a mom, I feel the anxiety of having too many toys. In fact, we know that children are happier with less things. Having fewer toys promotes better focus and more creativity. As an adult, I feel the rippling effect too. Just looking into my kids’ bedrooms can take my anxiety from a 2 to a 10 in a mere second. Soon after having two children, I decided to focus on less toys for gift ideas. We wanted to focus on memories, using less, and making the most of practical items. Here’s what we started doing instead. Experience gifts are my favorite non-toy kid gift idea. I love having the moments of being together and talking about them year after year. Plus, no packaging to have to break into. I try to bring the camera to savor these moments. Movie Gift – A trip to the movie theatre is one of our favorites. Or on a tight budget, you can even do a movie in. Rent one on Amazon or Netflix while wearing pajamas and make your own popcorn. Bookstore Trip – My kids can’t wait for their birthdays because they get a visit to the bookstore. I love seeing the look on my children’s faces when they get to choose the books they want to read for the upcoming year. 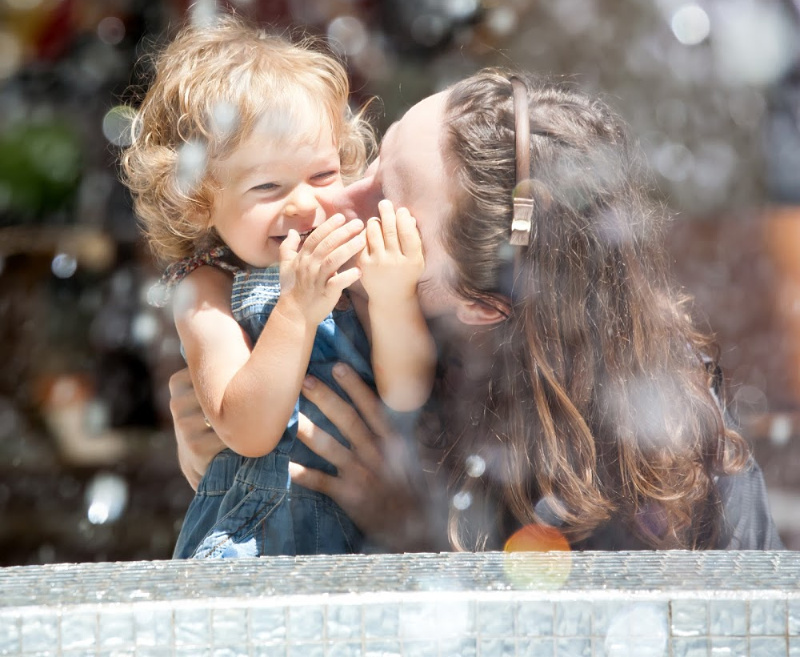 Date Night – A visit to a favorite ice cream shop or other treat is something my kids beg for. Whether it’s hot cocoa, frozen yogurt, a smoothie, their favorite restaurant, or anything else, you’ll be having fun together. Family Vacations – Science tells us that family vacations are definitely the way to go over lots of toys! This is one of my all-time favorite items to gift! Find the right book and you have a perfect gift or keepsake. Picture books– You can never go wrong with the classics like Brown Bear, Brown Bear, What Do You See? and The Giving Tree. These are my favorite preschool picture books! Quiet time felt books– Quiet time books are some of my favorites! Some of the best ones are over on Etsy, or you can make your own quiet books with these patterns! 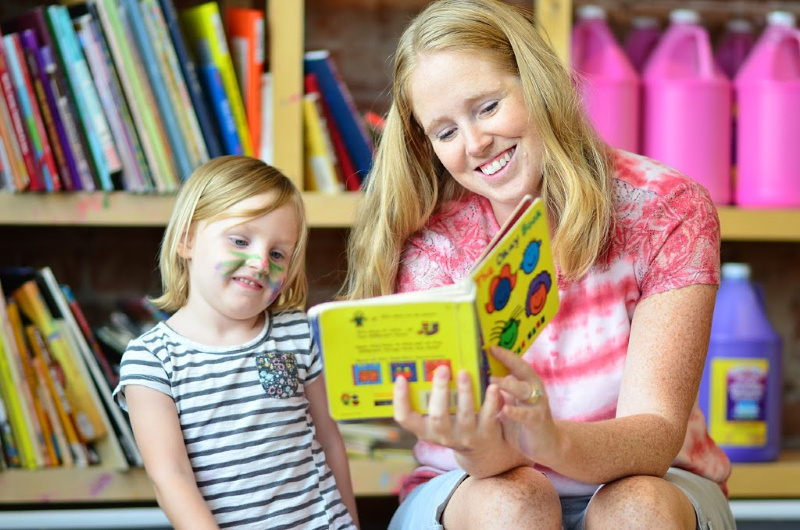 Learning to read books– One of our absolute favorites is ABC, See, Hear, Do because of the animals and fun actions to go with it. BOB Books have simple drawings that my kids have loved to read over and over again. And we have adored Usborne’s Very First Reading books. They actually have so many reading books, but my favorite is the dual reading ones, where there is a reading part for the adult and shorter, larger print version for the child. Joke books – My son’s favorite is Just Joking by National Geographic kids because of all the awesome animal photos, and my daughter loves Laugh Out Loud Jokes for Kids because of the fun and clever jokes. It’s a great one for the whole family! LEGO books – If you have a LEGO lover, these idea books are amazing! My kids especially love Awesome LEGO Creations and Genius LEGO Inventions. Since LEGOs are the one toy that gets played with every day in our house, this is something they love. 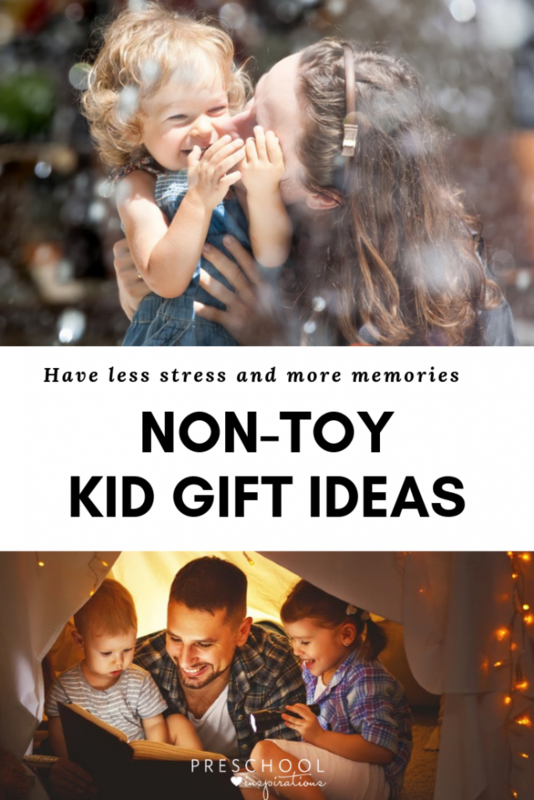 These non-toy kid gift ideas are a great way to organize the current toys and help take away that mom anxiety that I get whenever I look into their rooms! In other words, these gifts are practical and functional. Stuffed Animal Bean Bag – A home for the beloved stuffies doubles as a storage solution at the same time! Book Shelf– If you have a good number of books, this is one of our favorite ways to display them (and baskets too!). My daughter picks one each night before I tuck her into her bed, and I love that we can see the cover and choose with a quick glance. Bank -We started using a 3 part bank for my kids to help them learn to share, spend, and save. My kids love their banks, and they make the perfect non-toy kid gift. Plus, my kids are started to learn more about financial responsibility. Clocks – Clocks are perfect because they are practical, educational, and exciting at the same time. Our favorite clock for preschoolers is this one with animals and colors, and we also love the LEGO figure alarm clocks for older kids! 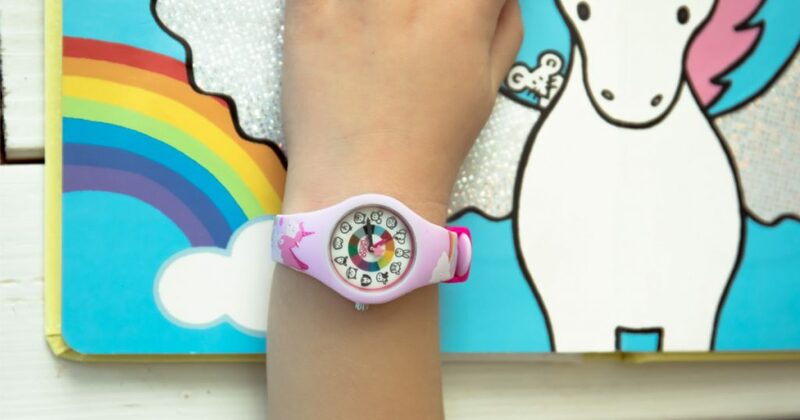 Watches -Kids love watches! Plus, they are learning to work on time while wearing their favorite animal or character. 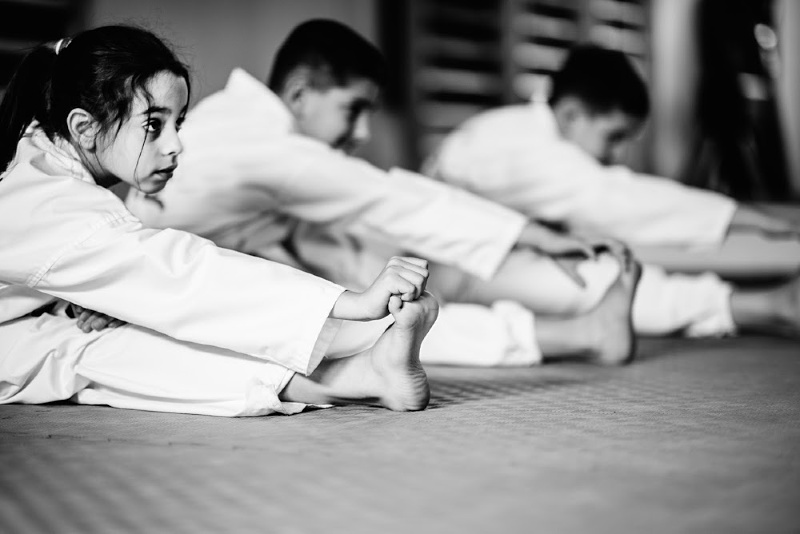 For my older kids, we’re already talking about smartwatches to help keep track of where they are and to communicate with them without a phone. Shoes – It’s crazy how fast kids grow out of shoes, and we love to gift them whether they are for formal events, for fun, or even special shoes that light up. Winter gear – Scarves, gloves, mittens, hoodies, and more are always welcome in our house, and I know we aren’t the only ones looking for that lost glove. Plus, soft socks are the best! Cozy pajamas – There’s nothing like a perfectly soft pair of pajamas. Especially if you pair it with a robe and slippers! 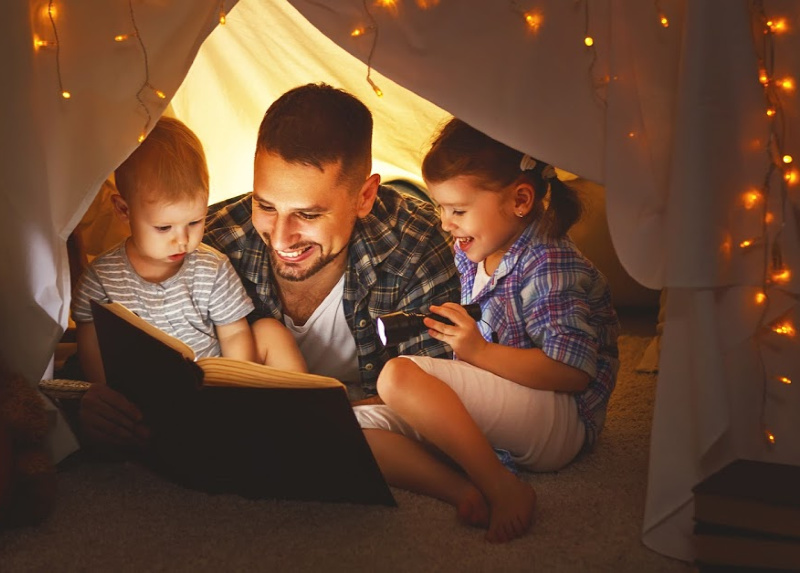 Outfits with their favorite color or favorite character – Kids love to wear anything with their favorite character, and these make some of the best gifts because they get lots of use and love. Dress up clothes – Dress up clothes are not just for Halloween! They make perfect gifts and dress up shoes are always a hit too! No kid gift idea list is complete without these memory gifts! Camera – One year I gifted my oldest a camera, and we printed the best pictures from it. She was six-years-old at the time. It was so beautiful to see things from her perspective, and it has so many memories I wouldn’t have thought to document. I hope these kid gift ideas bring you more joy for giving to the kids in your life. And less stress!